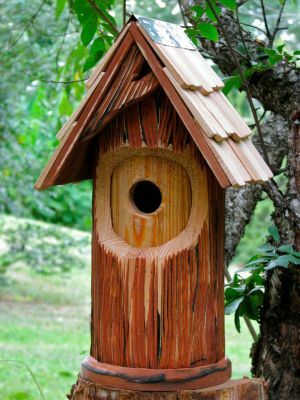 Add a touch of magical forest to your lawn or garden with The Woodcutter, an enchanting combination of rustic simplicity and beautifully imaginative design details, like the dramatic asymmetrical "winged" front gable. Like its fairy tale namesake, Heartwood's Woodcutter is a strong, sturdy and reliable protector of precious characters - like, for example, your own beloved birds. Storybook perfection plus rugged construction for real-world use make this round house an all-round favorite! 1½" Hole -- mounting plate included.